Esther D. Reed joined the Department of Theology and Religion in 2007. Previously, she taught for ten years at the University of St Andrews including one semester as the visiting O'Connor Professor at Colgate University, NY (Spring 2007). She is President of the UK Society for the Study of Christian Ethics Sept 2018-August 2021.
reverse the agent-act-consequence sequence to an understanding of responsibility that originates in You, that is learned from Christ and neighbor. At the invitation of the Fleet Commander, Esther D. Reed is performing a role in the Naval Service Ethics Programme's (NSEP) reinvigoration of professional ethics training and eduction throughout career courses. The Royal Navy ethos is well defined, rooted in long and distinguished history. "The enduring spirit derived from our people's loyalty to their ship, unit or team, sustained by high professional standards and strong leadership that gives us courage in adversity and the determination to fight and win” (BRd 3(1), Ch. 21, Annex 21H). The NSEP is reviewing current training with a view to enhancing best practice, promoting innovative teaching and education, and researching diverse approaches to building cultures of ethical responsibility across all ranks. The marks of ecclesial citizenship found in Acts 1-7 include koinonia, leiturgia, diakonia, praeconia and martyria. In this exegetically-rooted project, these marks are explicated and appropriated for a wider ethic of citizenship, with particular application to contexts of growing social inequality. The task is to formulate criteria for an ethic of citizenship at the interface between ecclesial life and political practice. My research life began with a study of the political theology of Dorothee Soelle. Her work inspired me to study the pathologies of the modern era through the lens of G.W.F. Hegel's construal of the master/slave dialectic and theory of recognition. After completion of the PhD, I concentrated on relations between Hegel and Schleiermacher and on some of Schleiermacher's early political writings and hermeneutic theory. The journey then became a more focussed study of the systematic theological foundations of Christian ethics and moral reasoning. The Genesis of Ethics: On the Authority of God as the Origin of Christian Ethics (2000/2002) is a response to the challenge of radical, post-Christian feminists that the authority of God is the problem of Christian ethics not its answer. Using Mikhail Bakhtin's idea of authoring, the book explores connections between divine authoring and authority. Christian ethics is understood in terms of the answerability of God's Word. The Ethics of Human Rights: Contested Doctrinal Problems (2007) offers an account of 'right', 'rights' and 'Christ the measure of natural rights' that seeks to support Christian people who use human rights instruments in diverse practical and legal contexts. Following Dietrich Bonhoeffer's starting point for discussion of natural rights, namely, Ecce Homo! 'Behold the Man' (Jn 19:5), the book argues that neither antagonism nor indifference are the only options available to Christian people in dialogue with, or working with, secularist approaches to human rights. A tropological reading of Genesis 9:1-17, God's covenant with Noah, is developed as a means of asking how the bible challenges, directs and gives substance to critical Christian engagement with human rights discourse. Written at a time when many secularist theorists seem variously unable or unwilling to denounce torture as wrong, Theology for International Law (2013) offers a systematic engagement with contemporary issues of international law and its relevance for modern theology. Christian theology is familiar with questions about the relation of church and state, divine and human law, but little attention has been devoted to questions of international law. This book discusses challenges to classic just-war thinking from so-called fourth generation warfare, peoples and nationhood within divine providence, the ethics of territorial borders and the militarization of human intervention. My current work is on a monograph entitled (provisionally) The Limits of Responsibility: Dietrich Bonhoeffer and Christian Ethics in a Globalizing Age. Responsibility is not a new topic in Christian ethics but too many accounts are delimited to the immediately personal. Christian ethicists are ill equipped to think about questions of responsibility that extend beyond a tightly drawn agent-act causality nexus. The discipline is familiar with the topic of consumption where implications for action lead fairly directly to the need for lifestyle changes respect to food and clothing, whether or not to travel, whether to buy books electronically, renovating furniture rather than buying new, and such like. This book is about moral reasoning when relationships between agent, act and its consequences are often untraceable. I am very happy to discuss the possibility of research supervision in Christian ethics, practical and political theology. Contact me if you would like to talk through your project. 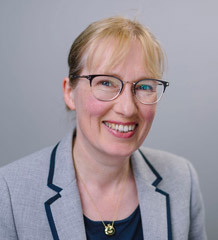 Esther is involved with the 'Art of Narrative Theology in Religious Education' project, which is working to examine relations between narrative theology and Christian ethics in Key Stage 3 RE. Esther has also given workshops on ethics and security, migration and asylum, and theology and international law, together with a consultation on the use of unmanned armed vehicles (drones).